Known as the Railway Capital of Canada, St. Thomas in Ontario’s Southwest has a rich history built on its railway heritage. At its peak, this Railway City in Elgin County served as a primary Canadian train stop on the short-cut between Detroit and Buffalo. Being a major hub for a multitude of railways played a crucial role in the growth of St. Thomas from a town of 1700 people in 1860 to 40,000 people today. When you enter St. Thomas thru the West End Gateway roundabout, you’ll be greeted by the statue Perseverance by local artist Scott McKay. 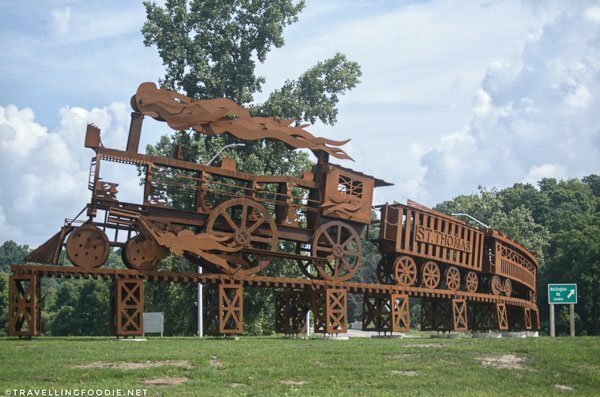 Travelling Foodie Tip: If you’re looking to take photos of this giant steel train statue, there is a small parking lot off the Sunset Drive exit of the roundabout. 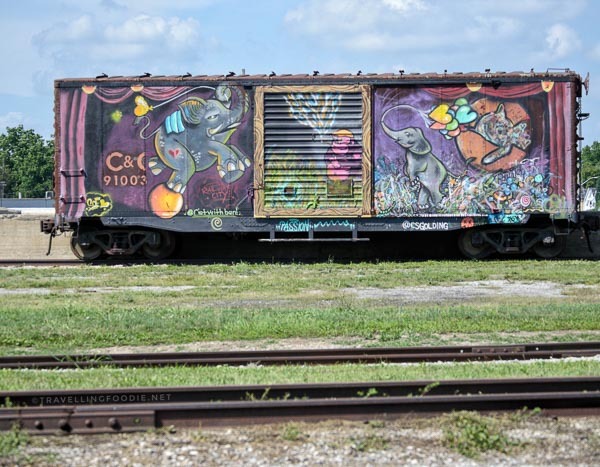 Located in the yard of the Elgin County Railway Museum is the newest Railcar Mural in town, painted in 2017 live during the Iron Horse Festival by local artists Ben Vandevooren and Chris Golding. 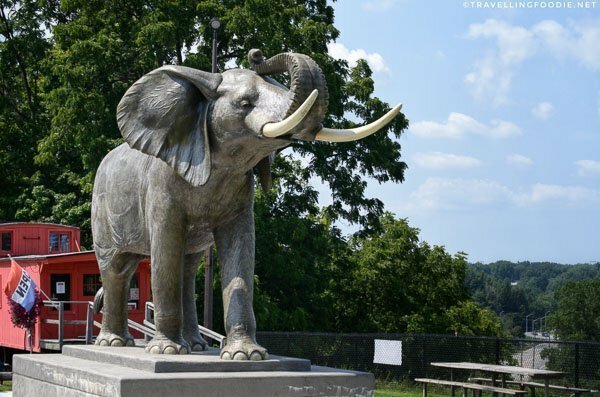 Two things I found out during my trip was that St. Thomas is home to Jumbo the Elephant and Canada’s first Elevated Park. Did you know? Jumbo was the inspiration to the Disney movie, Dumbo! Dubbed the “King of Elephants”, Jumbo (a 13,000 pound African elephant) is the most famous elephant in the world being the star of P.T. Barnum’s Greatest Show on Earth. 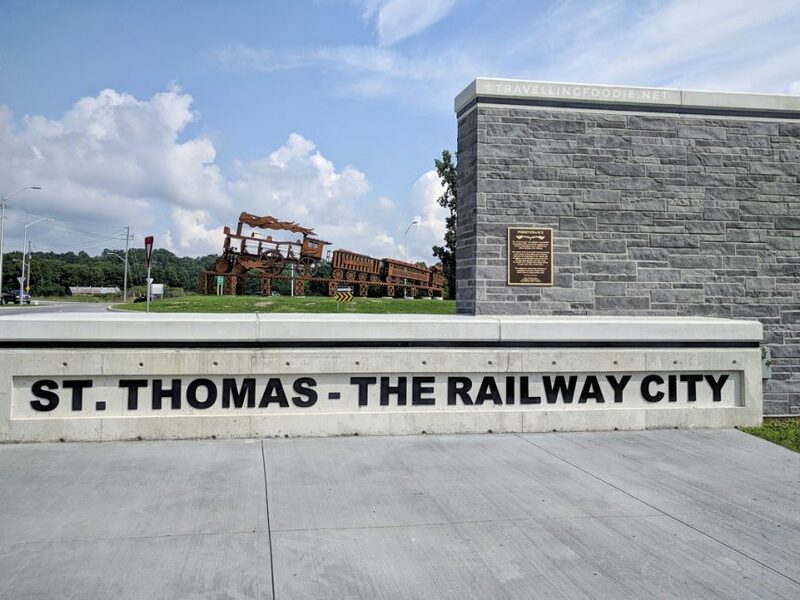 St. Thomas Elevated Park is located at the 86-year-old Michigan Central Railway bridge which used to carry some 50 trains each day. 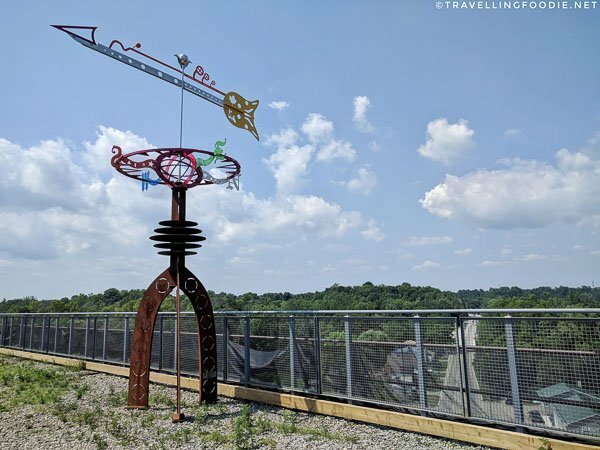 Elevated 95-feet over the Kettle Creek valley, it’s a park in the sky with views of the valley in all directions. Aside from its rich history, St. Thomas has a growing culinary scene driven by its surrounding farmlands and producers. 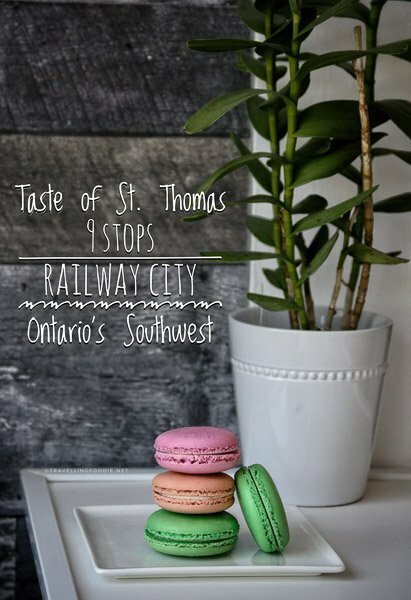 As part of the #TasteOfStThomas initiative, the Railway City combines its railway heritage with its food culture by having a culinary event, Conductor’s Choice – A Culinary Experience on Rails in September 22, 2018. 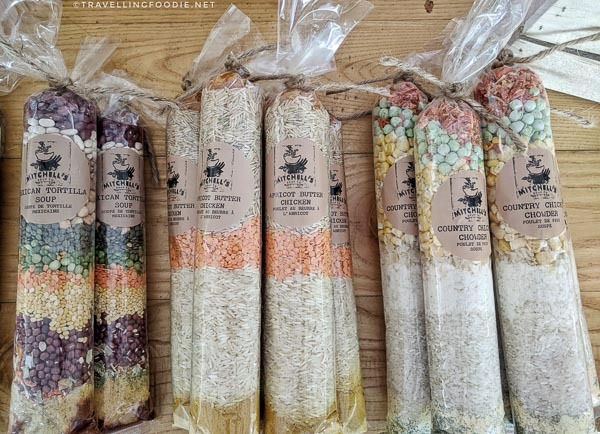 Perfect for Travelling Foodies! In this event, you board a train for a full day of culinary adventure hitting several of the places I visited. I explored the city for two days checking out its sights and trying out their culinary offerings. 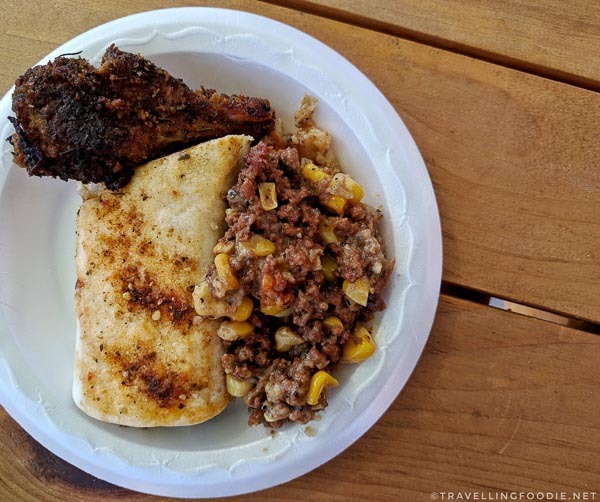 Here are 9 stops to get a Taste of St. Thomas featuring some of the best places to eat and drink in St. Thomas, and things to do along the way! 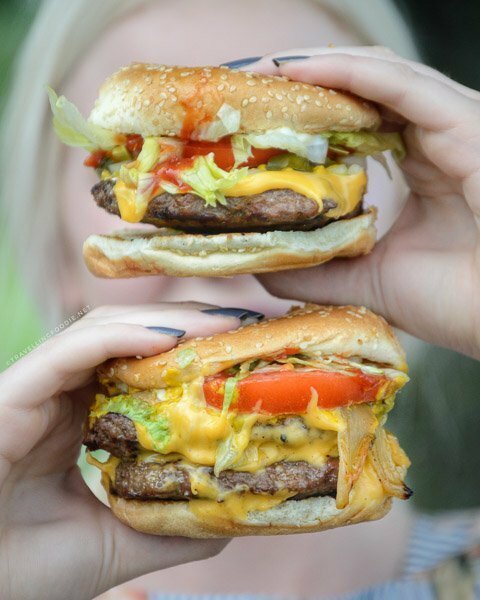 St. Thomas’ burger and fries game is strong with Snack Wacky Foods, located at the parking lot of Berry Hill Limited, an internet, mail order and bricks & mortar retail business. 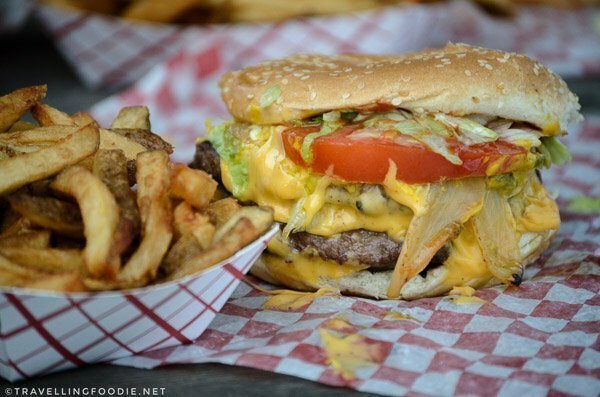 Named the Best Burger in the City by Steam City Media and Best Fries by Hometown St. Thomas, this hidden gem chip wagon offers some delicious no-frills homemade burgers with fresh cut fries made fresh on order! With all the hype on gourmet or over-the-top burgers out there, nothing beats a simple burger done right. This is what you get with Snack Wacky Foods. Be sure to add cheese! Love coffee? Las Chicas del Cafe is a must! Coffee runs in the family of owners Maria Fiallos and Valeria Fiallos-Soliman, with generations of coffee growers, importers and roasters. Did you know? Their family has a coffee farm in Las Sabanas, Nicaragua, making a coffee experience at Las Chicas del Cafe a true farm to cup experience! 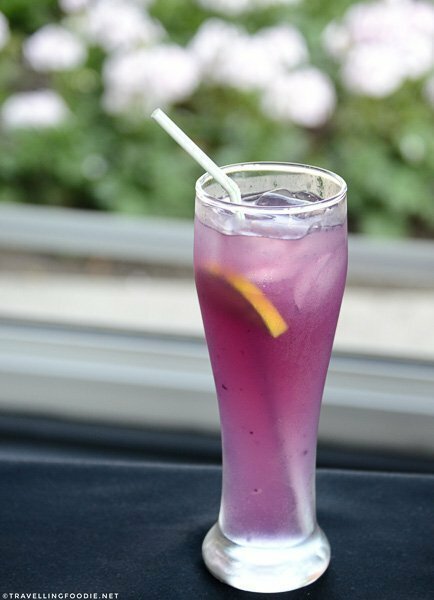 Las Chicas del Cafe started in November 2005 in London, Ontario before moving to St. Thomas in the summer of 2015. 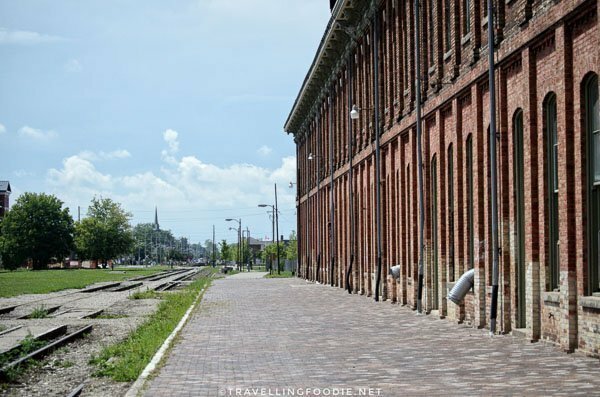 You get to visit a historic attraction while you’re here since the roastery is located at the Canada Southern (CASO) Railway Station, the largest of 31 railway stations built in Ontario during the 1870s by the Canada Southern Railway Company (CSR). 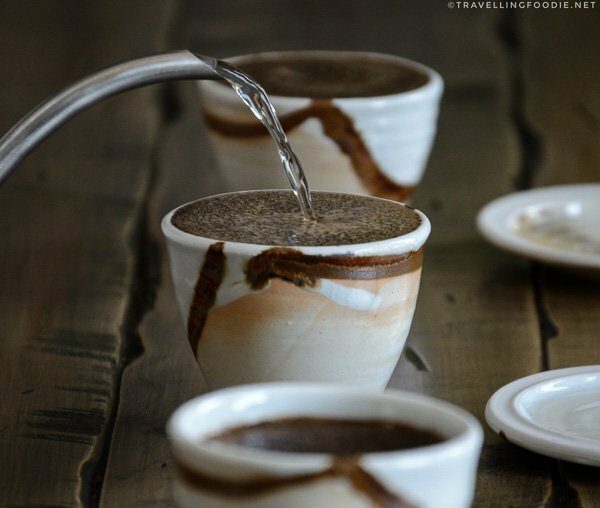 I’ve always found that coffee is underappreciated compared to tea (there’s a tea sommelier but nothing equivalent for coffee) so I was very surprised to learn they offer “coffee cupping”, a way to educate yourself with coffee thru tasting. This is a must experience especially if you want to deepen your taste for coffee. You will learn a lot from Maria with her knowledge and passion for coffee. 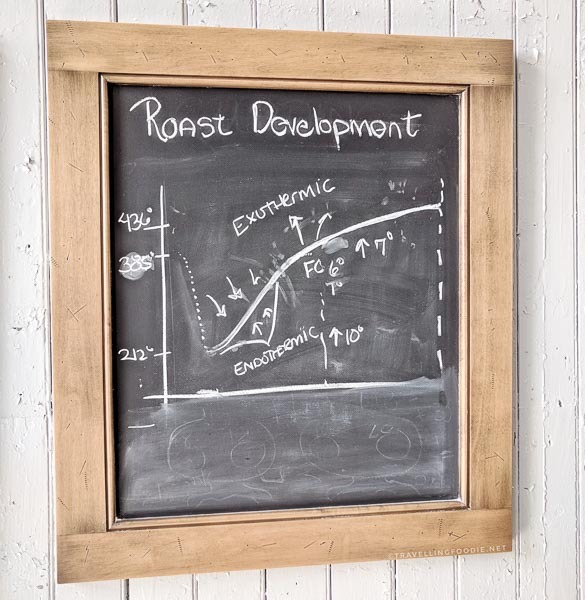 Roast Development: The turning temperature is the lowest point of the drop in the graph, and varies on the bean. In the endothermic stage, the beans are taking the energy and heat from the drum, which removes water for caramelization. In the exothermic stage, the beans start to caramelize which is when the beans start to crack (FC = First Crack). How you proceed after the first crack is what determines the flavour of the beans. During my coffee cupping experience, we sampled three cups from the same coffee beans BUT at different parts of the roast development. First, we smelled the beans on its own before water was added. Then, we smelled the coffee after water was added. Lastly, we tasted them (both when hot and when they cooled down). 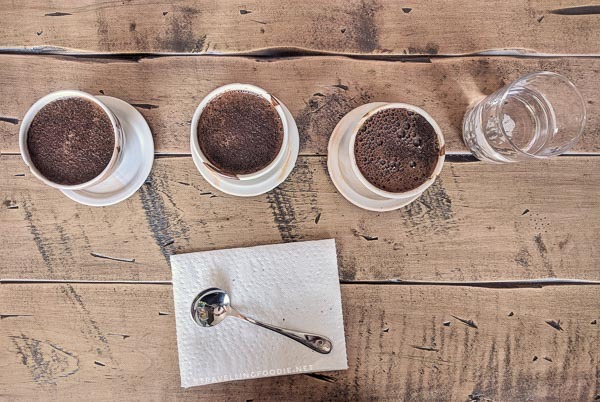 At each stage, you discuss your thoughts of the aroma, taste and mouthfeel. It’s astounding how coffee changes at each stage. Based on the aroma without water, I liked the middle one the most. When water was added, I was torn between the middle and right cups based on aroma. Upon tasting, I loved the right cup the most. Left to right cups vary by darkness of roast. Elgin Harvest is Elgin County’s first and (currently) only FeastON certified dining option. 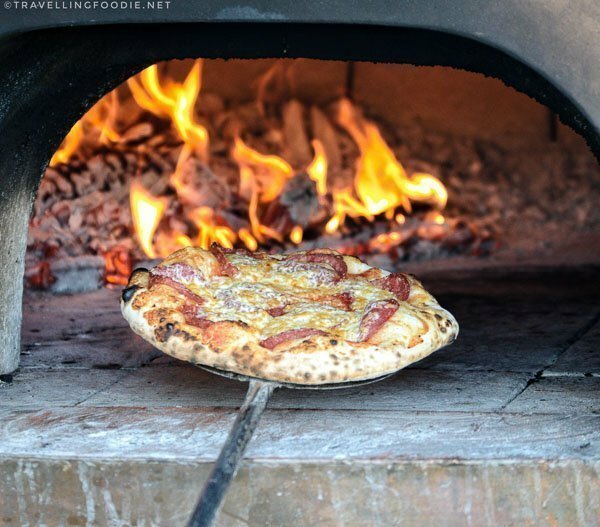 This mobile pizzeria offers wood-fired pizza in about 90 seconds using organic sourdough crust topped with locally sourced ingredients from owner Cindy Bircham’s vegetable garden or local farms. Cindy creates some seasonally-inspired pizzas like the Mexican Pepperoni and Kimchi Sausage. If you love spicy, I highly recommend the Mexican Pepperoni which had a great combination of flavours from the cilantro, avocado and corn relish, and a nice spicy kick from the fermented hot peppers. Since Elgin Harvest is mobile, you need to check their website on where they are popping up. The next stop below is one of them. 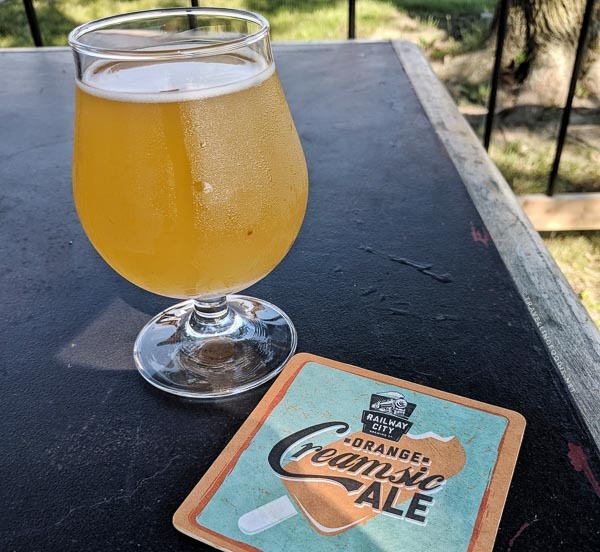 Celebrating 10 years in 2018, Railway City Brewing is a popular hangout for locals and visitors for their locally handcrafted small batch beers. Everything is done on-site from brewing to packaging. You can do tours ($5) or beer samples (flight of 4x3oz for $8), or both for $10. 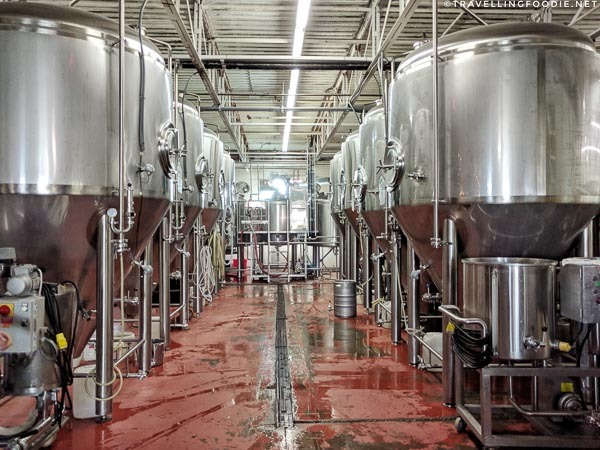 Their brewhouse is a 20-hectoliter system of 3 vessels (kettle, mash tun, hot liquor tank), along with 8×40-hectoliter fermenters, 8×20-hectoliter fermenters, a canning line and bottling machine. 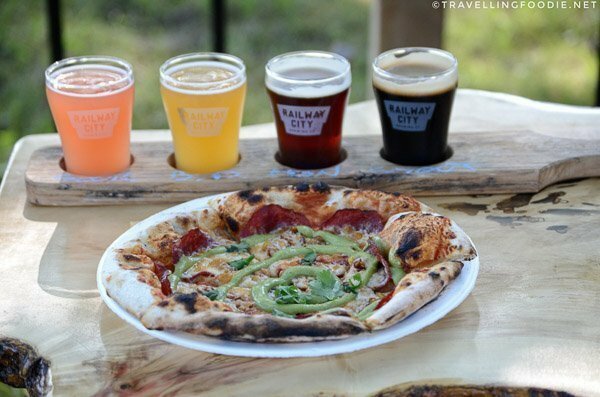 Railway City Brewing offer 10 beers with 1-2 rotating brews. Did you know? Their beers are also being sold in Japan! The top seller being the Dead Elephant Ale, named after St. Thomas’ Jumbo. They try to use local fresh ingredients when possible including local strawberries for their Steampunk Sour, and local honey for Honey Elixir Beer. They also use all natural ingredients for their beers. You should try their Orange Creamsic Ale! This seasonal summer beer uses 20-lbs of Navel oranges and real Madagascar vanilla bean. They host events as well including concerts and dart nights. On Fridays, it is wood-oven pizza night with Elgin Harvest! 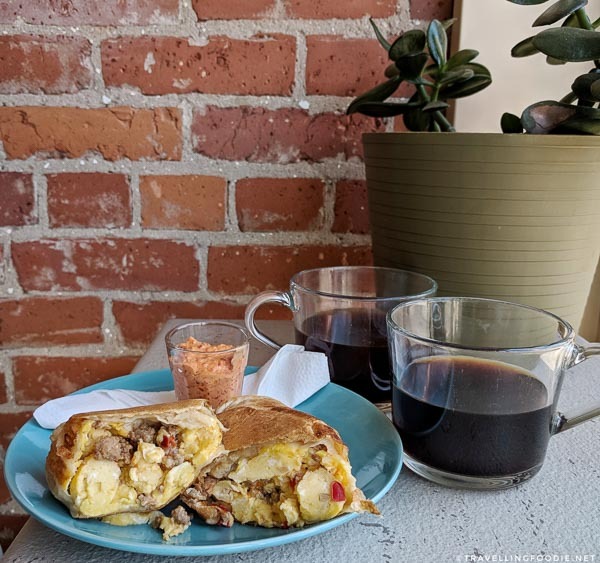 When you visit Las Chicas del Cafe, you’ll find out that it’s not really a cafe where you can hangout to enjoy coffee and some food. 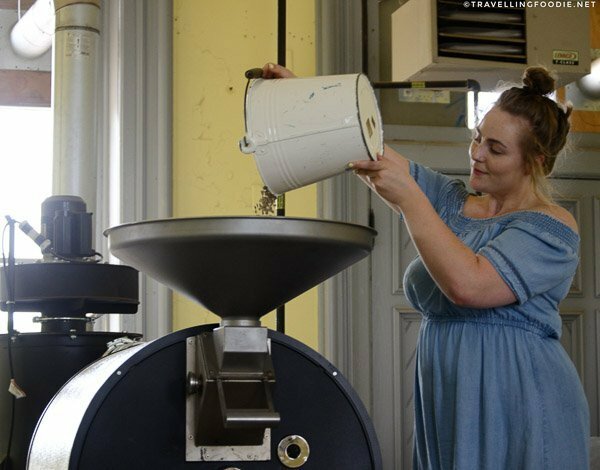 Enter Streamliners Espresso Bar, which opened in May 2017 brewing Las Chicas coffee. Co-owned by Las Chicas del Cafe’s Maria, you are guaranteed great coffee. I love that Maria is trying to shape the coffee culture in the community. 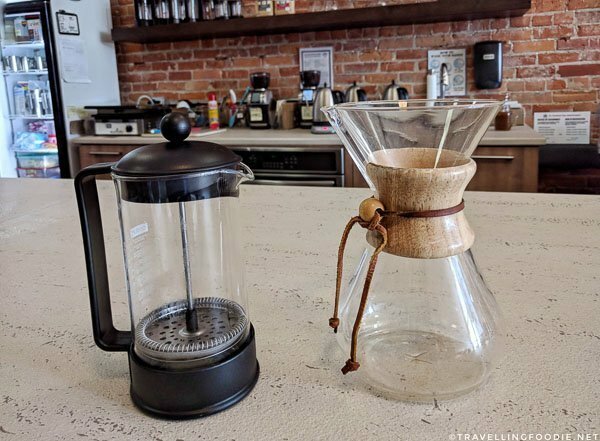 Instead of offering easy and quick drip coffee, Streamliners Espresso Bar only offers brewed coffee using Chemex or French Press ensuring proper enjoyment of the coffee. They also offer food in the cafe including homemade breakfast burritos and quiches. The homemade chorizo and egg burrito is a must-try! The wrapper is tastes more like crepe than a normal burrito wrapper, and the red pepper aioli is so flavourful! 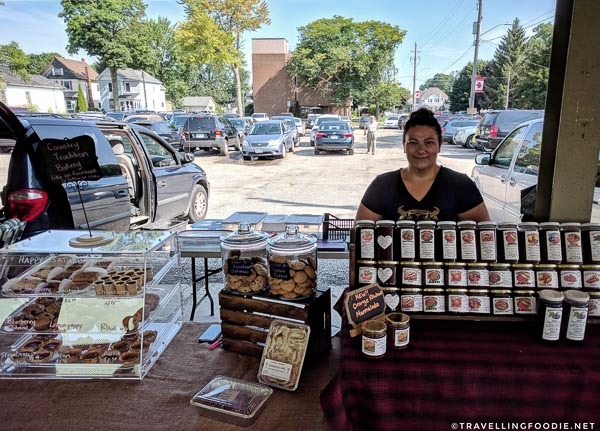 A great way to see the St. Thomas local culture is by going to the Horton Farmers Market, directly north of Streamliners Espresso Bar. Started in 1878, this gathering place has been a local tradition to buy fresh, local produce, socialize and experience the community. 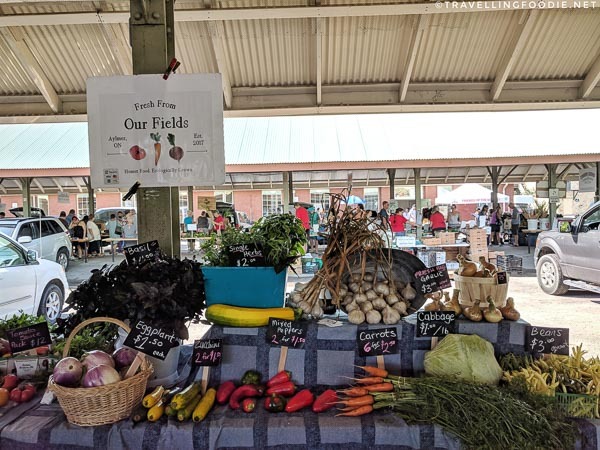 Owned by the city of St. Thomas, Hortons Farmers Market is a true farmers market, requiring 51% of its vendors to be farmers, and producers to have grown, made or enhanced all the goods which should be 60-kilometers around the market radius. Wanda’s Spicy Connection makes homemade spice combinations from fresh ingredients, gluten free, no msg and 8-14 single raw spices in every “little bag, with big flavour”. Mitchell’s Soup Co. offers one pot meals ($8.99) that are locally made and low in sodium. I love that the market also promotes entrepreneurship. 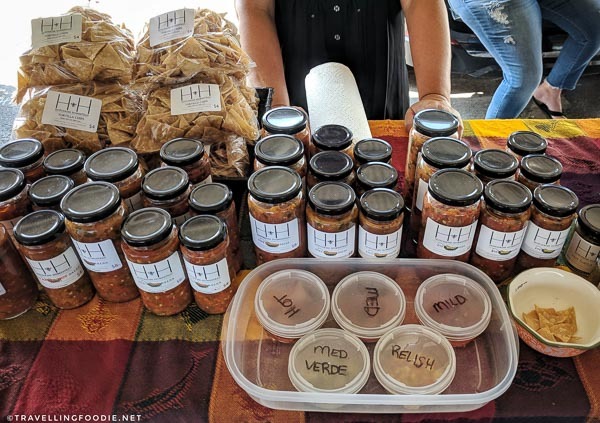 You’ll find vendors who just want to start their own business or try something new, and even young student vendors who came from the Summer Company Program by the Elgin/St.Thomas Small Business Enterprise Centre. 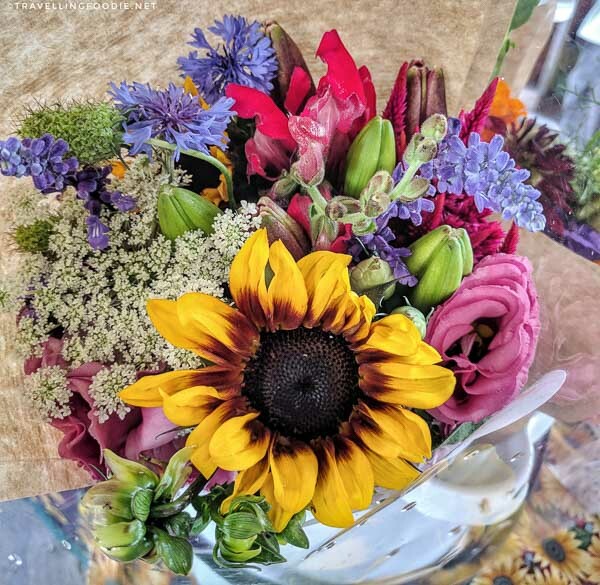 Some vendors will also be participating in the Conductor’s Choice Culinary Tour including Harris Flower Farms, Fresh from our Fields, and Wildflowers Tea Bar. Harris Flower Farms grows fresh seasonal cut flowers from their small family operation in Elgin County. Fresh From Our Fields offers vegetables grown sustainably in their fields in Aylmer. 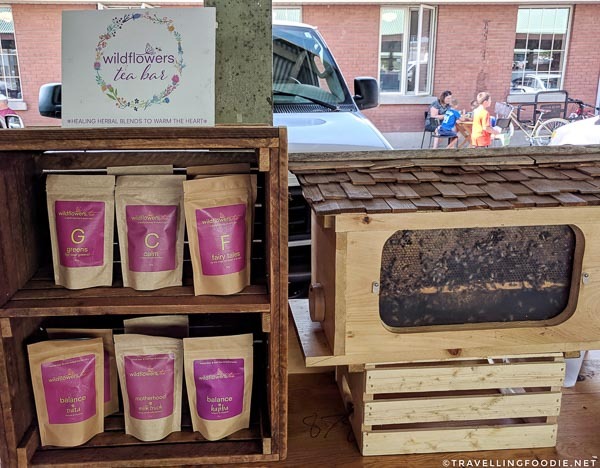 Wildflowers Tea offers organic herbal teas, iced teas and herbal baths, along with honey from their apiary. 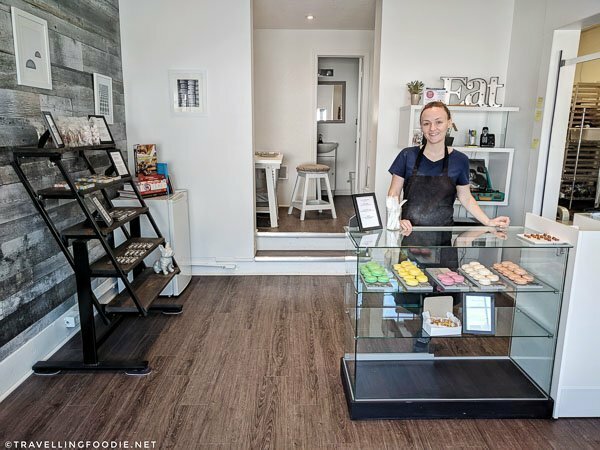 Seed Confections is a small batch, handcrafted, artisan chocolate and confection shop owned by chocolatier Genevieve Scarfone, a St. Thomas local who has worked all over Canada to perfect her craft. 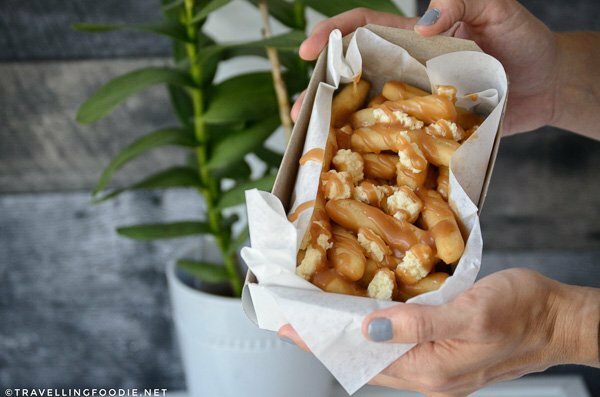 One thing I love about travelling is finding unique culinary creations, and the Donut Poutine here is definitely one of them: donuts as fries for the crisp, the cheesecake curds adds a tangy taste to the sweet and salty salted caramel gravy. On top of that, it’s Insta-worthy! You’ll want to check out the macarons because there are some very interesting seasonal flavours like Long Island Iced Tea (yes – with alcohol) and Pomegranate Molasses. 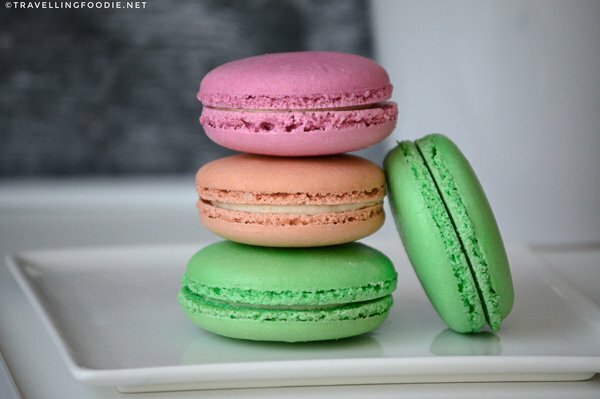 Better yet, some macarons are in collaboration with local business in Elgin County like Steed Lavender for lavender macarons and Railway City Brewing for beer-based macarons. When visiting small towns, I typically don’t even bother with Asian restaurants because it’s usually catered to non-Asians or not authentic. Le Cafe Siam proved me wrong. 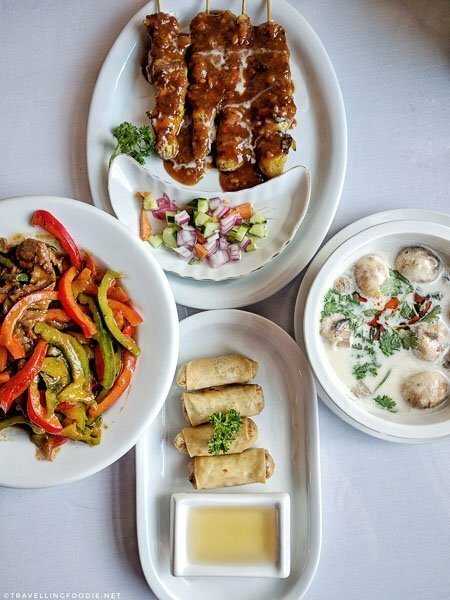 Opened by a Thai family over a decade ago, this Thai restaurant in downtown St. Thomas offers some amazing Thai food putting even some of Toronto’s Thai restaurants to shame. 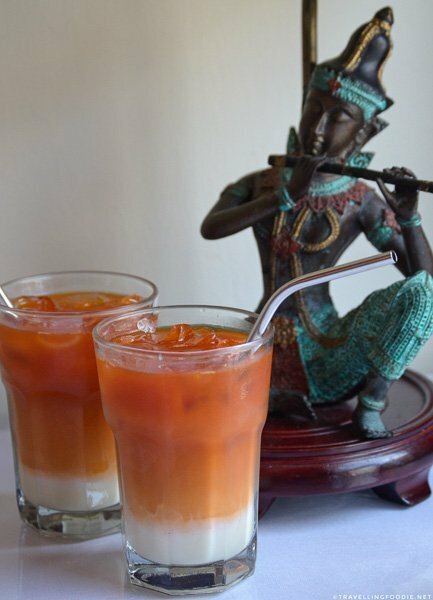 Le Cafe Siam is decorated with traditional royal Thai art, weaponry and antiques. I highly recommend the Tom Kha and Panang Curry here. 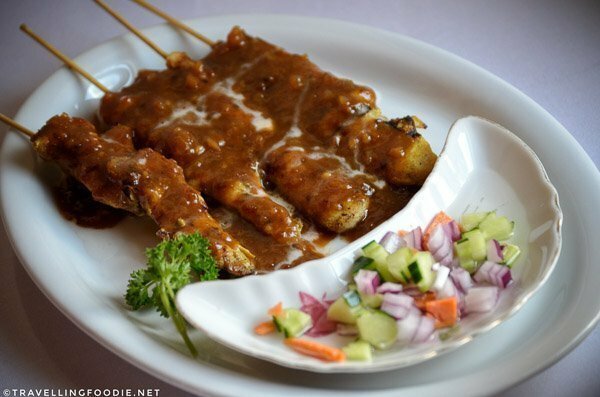 These two are pretty uncommon in Thai restaurants so I typically order them when I see them on the menu. The Panang (Phanaeng) Curry was very fragrant and flavourful with a nice mix of sweet and salty from the curry, coconut broth and kaffir lime leaves. I pour the curry on the rice, and even dip other items to the curry because it’s so good! 2. (left) Beef Panang Curry ($13.95) – Gluten friendly. Sliced meat cooked in aromatic Panang curry coconut broth, topped with kaffir lime leaves and peppers. 4. (right) Tom Kha Gai / Galangal, Chicken, and Coconut Broth Soup ($6.95) – Gluten friendly. Chicken with mushrooms, lemongrass, galangal, lime juice, and kaffir leaves, in a coconut broth. 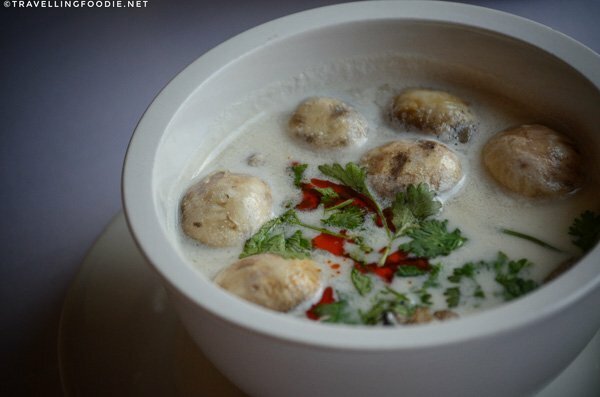 One of my favourite soups is Tom Kha, and the one here definitely delivered. Very aromatic, silky and flavourful, it’s as authentic as you can get with all its required ingredients! And it’s not really spicy so anyone can try it. Near Le Cafe Siam is St. Thomas Elgin Public Art Centre (STEPAC) so you can check it out before or after eating. Exhibit tours are free of charge. 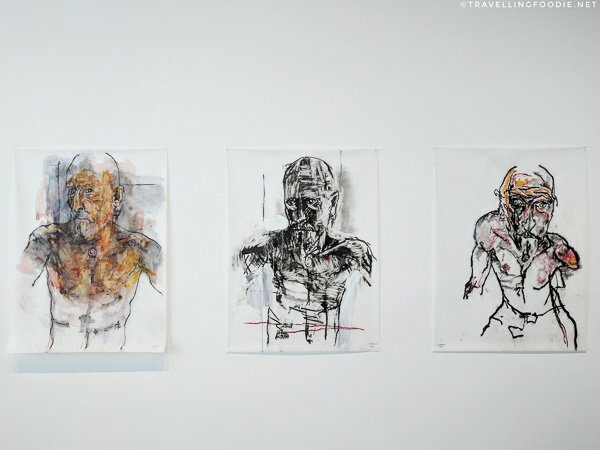 When I visited, the exhibit was Francis Caprani’s Ghost in the Machine, an exhibition into the exploration of the self portrait. Rail City Bistro opened in June 2016 by husband and wife team Jared and Lindsay. Jared is Chef bringing over 15 years of kitchen experience, and Lindsey is the front-of-house manager with over 15 years in the hospitality industry (and she also makes the desserts). It prides itself in offering high end dishes at normal prices featuring regions from all over the world. Their regular menu has a mix of dishes like Seafood Paella (Spanish), Tuscan Chicken Pasta (Italy) and Asian Stir Fry. RCB Magic Tea ($8) – 1/2oz each vodka, tequila, gin, triple sec and spiced rum. Splash ginger ale. 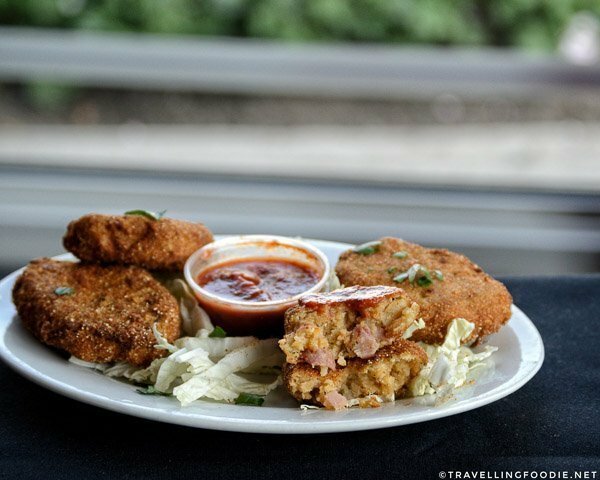 No restaurant in St. Thomas says Travelling Foodie more than Rail City Bistro. Every weekend, they feature a special menu inspired by a specific location around the world. The location they choose is through their conversations, bouncing of ideas, and researching online. During my visit, the weekend feature was Spain where they offered an appetizer, main and dessert. Croquettes ($8) – ham and cheese croquettes using Serrano ham from Spain. 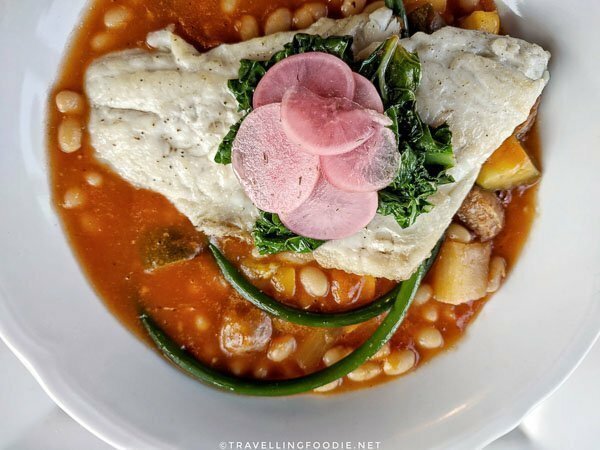 The perfectly cooked Sea Bass came with a northern Spanish food called Fabada Asturiana (Spanish Bean Stew), originating from Asturias where the people would mix fabes (white beans) with any meat leftovers that they had. 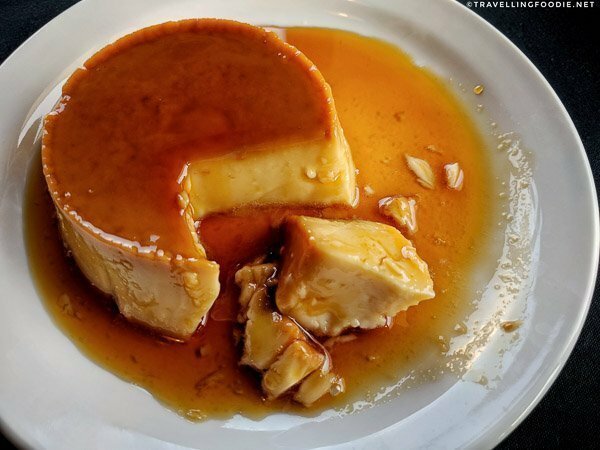 If you see the Caramel Flan again, order it! This popular Spanish dessert was ultra-creamy with a silky texture. Just outside Rail City Bistro is the Railway City Tourism office, which is located in a replica of The London and Port Stanley Railway Station. Did you know? This replica of one of Ontario’s oldest railways is a 3/4th scale of the original that once stood in the same location. 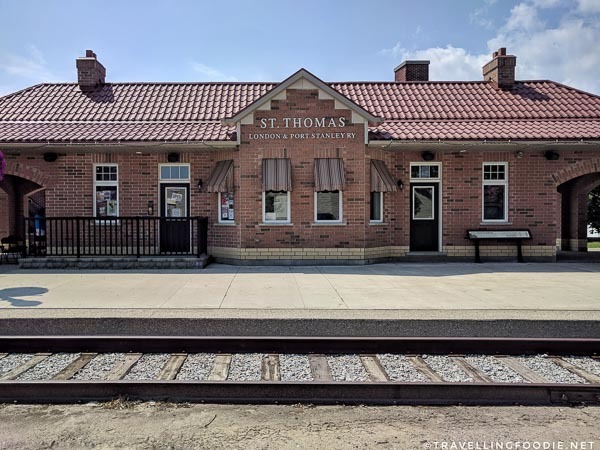 Hope this gives you a great idea on where to eat and some things to do in St. Thomas, Ontario, the Railway City! Huge thanks to Ontario’s Southwest and Railyway City Tourism for sponsoring this post. As usual, reviews and opinions are entirely my own. You can learn more about Ontario’s Southwest thru their website, or find them in Facebook, Twitter and Instagram. … and about (St. Thomas) Railway City Tourism thru their website, or find them in Facebook, Twitter and Instagram. 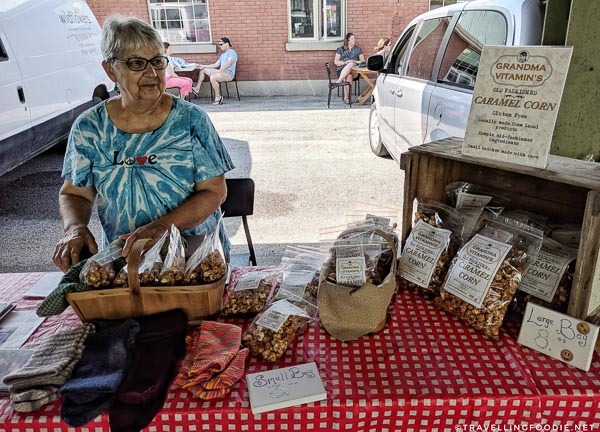 Posted on August 28, 2018 January 1, 2019 by Travelling FoodiePosted in Canada, Elgin County, Food, Ontario, St. ThomasTagged events, food trip, nature, products, restaurants, sights and landmarks. one thing though. it’s Scott McKay, not McKaya. I have updated the typo on Scott’s name. Someone pointed it out to me too. Thanks! Right? Definitely not something I was expecting from a small city. What did you try?